Just finished writing up a post over at RK on the major coal plant ruling in Georgia. I should be happy that it dramatically increases the likelihood the planned Wise County coal-fired power plant will be blocked. The Wise County plant's permits allow for unlimited carbon dioxide emissions, which the Georgia judge ruled are a no-no under Massachusetts vs. EPA. But it's a lose-lose-lose situation. Wise County doesn't get the jobs. Virginia's clean energy future remains murky. And we're no closer to global warming solutions. As for Gov. Tim Kaine, a year ago, I hoped to convince him to change his mind on the Wise County plant. But he only dug in his heels deeper. That seems to be his style. He's a brawler. He doesn't want to be persuaded - he'll show you who's boss. Now it looks like he'll go down with the ship on Wise County. And I can't be happy about that, either. As I got to the last paragraph of that RK post thinking about Kaine's legacy, Coldplay's Viva la Vida kept playing in my head. "I used to rule the world ..."
Virginia's Air Pollution Control Board last week approved Dominion's permit to build a coal-fired power plant in Wise County. You can read a first-hand account at the Chesapeake Climate Action Network's blog. The Southern Environmental Law Center has vowed to continue the fight against the Wise County plant in court. The biggest losers are Virginia consumers who will now have to pay high costs in both the short term and long run. In the short term, we'll be paying at least $1.8 billion to build the plant. And in the long term, we'll bear the burden of skyrocketing coal prices along with any national carbon pricing. Opportunity lost for Gov. Tim Kaine, a relentless cheerleader for Dominion and coal who has seen his national standing tarnished and his statewide approval rating drop to 46 percent. There are many factors to Kaine's plummeting popularity like the ongoing gridlock on transportation solutions and his signing of the estate tax repeal. But his have-it-both-ways environmental stance - talking tough but refusing to take a stand on coal - has managed to tick off everyone, angering both flat-Earth conservatives and climate activist liberals. Opportunity lost for U.S. Senate candidate Mark Warner, who put forth a strong energy plan but passed on an opportunity to put his principles into action. Warner instead pandered on the power plant while in southwest Virginia, calling it the proposed plant "an economic engine for the whole region" even though the SCC has said the plant would result in a net loss statewide of 1,474 jobs. Is Warner a Kaine clone - saying one thing in Northern Virginia and another down south? Opportunity lost for gubernatorial candidates Creigh Deeds and Brian Moran, who've chosen to stay completely silent on the most critical environmental issue our state has faced this year. Environmentalists fought hard to elect Tim Kaine, only to see him take environmental stances so soft they should be served in a mini-helmet covered in strawberry sauce and walnuts. Why should environmentalists bother fighting for either Deeds or Moran if they side with Dominion and coal over clean energy and climate action? If Virginia Republicans were savvy, they could follow the models of Gov. Charlie Crist (R-FL) and Gov. Arnold Schwarzenegger (R-CA), using environmental issues to win over moderate voters. But they're much too busy targeting immigrant families, trying to ban all abortions, and blocking funding for transportation solutions. How Are Rising Gas Prices Impacting EnviroCAB? I think the rising cost of gas is just showing everyone that going green does not have to be a financial impairment. A few weeks ago I was talking with a driver of a traditional taxi, he said that he spends about $65 a day on gasoline. Even with the $1 fuel surcharge he was still struggling to make money. Meanwhile, our drivers are typically spending $35 dollars a day to drive the same amount of miles. I would say that typically our drivers are the happiest around. They are helping to build this business from the ground up. When they see that we are taking on more and more corporate accounts, and they have the same customers calling everyday because they refuse to ride in anything but an enviroCAB, its must give them a great sense of ownership and accomplishment. Have you added enviroCAB to your cell phone contacts yet? If not, do it right now so you have it whenever you need a cab. The number is (703) 920-3333. While China maintains the air quality in Beijing will be acceptable for the Summer Games in August, extensive environmental concerns persist. The New York Times reports, "Independent scientists who have sampled Beijing’s air have said levels of ozone and particulate matter from diesel engines remain five times as high as maximum standards set by the World Health Organization. ESPN's "Outside the Lines" reported this week that concerns about poor performance in the polluted air are running so high, Olympic officials have taken the unusual step of informing athletes that the games are about the "spirit of competition," not breaking records. I have several VHS tapes - movies and some blanks. What do you think is the best way to recycle them? Thanks! First of all, The Green Miles strongly recommends carrying at least five VHS tapes on you at all times in case you're stranded on a deserted island. Could come in handy. It doesn't look like there's any easy way for consumers to recycle small quantities of VHS tapes. I'm just guessing here, but I'd think there are just too many different types of plastic, metal and chemicals in too small a package to make it worthwhile. However, that doesn't mean you can't give the tapes new life. The website eHow has several recommendations for donating old tapes to places that can get more use of out them. And for really creative folks, MyRecycledBags.com offers instructions for using the tape itself to make a crocheted sling bag. UPDATE 6/30: Just heard about this option for businesses or apartment/condo complexes -- the GreenDisk Tecnhotrash can. Welcome to The Green Miles' second birthday party! 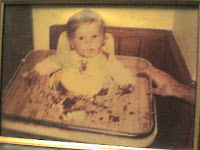 Sorry, but as usual, my one-year-old self ate all the cake. My first post was a review of An Inconvenient Truth. It seems almost surprising that the movie only came out that long ago considering how much has changed in the global warming debate since then. We've gone from debating whether warming is happening to whether it's our fault to what we need to do about it. You can subscribe to The Green Miles thanks to FeedBurner. What happens to a site or article I like but don't have time to write a whole blog post about? It's added to the del.icio.us box on the right side of the page. You can also follow what I'm reading by adding me as a friend at Digg or StumbleUpon. I update the The Green Links about once a month, adding new pages as I find them and deleting dead links or abandoned blogs. Any suggestions for better organizing the links or do you like them the way they are as one long list? The Green Miles doesn't accept ads and has no plans to. Donate to The Green Miles' favorite nonprofit, Arlingtonians for a Clean Environment, through the SixDegrees.org box. A $20 donation will get you a one-year individual membership. Can you expect any changes over the next year? Even though I'm blogging more at other places like RK, I'll always keep The Green Miles going, though you might see a slight increase in half-assed posts. But I actually find the busier I am outside The Green Miles, the more I post. I wind up getting more ideas and want to get them up here. The biggest change over the next year will be a subtle one. I've upgraded my cell phone, so you should see much better quality photos here. As always, thanks for reading. If you didn't keep coming back, I wouldn't keep writing. The visits, comments and emails are what get me to wake up early before work and fire up the organic coffee to get a post going! 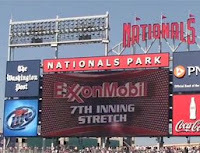 The Chesapeake Climate Action Network just launched a new campaign highlighting ExxonMobil's extensive sponsorship of the Washington Nationals and their new ballpark. The Green Miles wasn't sure how to react at first. After all, the Nationals have one of the greenest ballparks in the majors. Should being a green business mean you can't make as much money as you can off ads? Bring in any MLB team merchandise and trade it in for a Nationals hat made from organically-grown cotton. One hat per person, while supplies last. It's recycling old merchandise! And the hats are made with organic cotton! What could be more green than that? Pay no attention to the fact that it's sponsored by one of the least moral corporations in the history of the planet! And when I say least moral, I'm not just talking about ExxonMobil's ongoing leadership role in denying global warming and blocking climate action. Just check out ExxonMobil's Wikipedia entry. Environmental abuses galore, sure. But also shady foreign business practices. Supporting human rights abuses. A zero score on gay issues from the Human Rights Campaign. I recently made a trip down to Broad Run, VA to visit Pearmund Cellars, a sustainable winery (more on their green features here). Pearmund was donating a bottle of their Ameritage Reserve, two Pearmund wine glasses and some free tasting certificates to the Arlingtonians for a Clean Environment 30th Anniversary event. So The Green Miles generously agreed to go down and pick up the donation. And drink some wine. Anything for a good cause, right? As regular readers know, I tend to stick to beer, but apparently I'm going to be drinking lots of wine this summer, because I walked out of Pearmund with a full case of wine. Note to friends of The Green Miles - I'm going to need help drinking it. I know I can count on your support during these trying times. My favorites? For red, I'd go with the Ameritage. But on a hot summer night, I'd definitely pick their Sauvignon Blanc. But why take my word for it? A tasting's only $5 per person and Pearmund is a beautiful 45-minute drive from Arlington. To continue your wine tasting over dinner, check out Iron Bridge Wine Co. in neighboring Warrenton. It's Not Illegal Dumping If It's At The Recycling Center, Right? Note that the items on the right are meticulously leaned up against the trash can -- because as everyone knows, it's not illegal dumping if it's in contact with the trash can. That giant chair is no different than the gum wrapper at the bottom of the can! And then since everything else is in physical contact with the first items in a chain, everything counts as trash! Clearly not illegal dumping! Am I right, people? Who's with me? Here, look at the monkey. Look at the silly monkey! To learn more about proper recycling, visit the site of Arlington County's recycling programs. If you want to sample organic ale without the high price tag, Busboys and Poets in Shirlington hosts its Organic Beer Happy Hour every Wednesday. You can try Wolaver's Organic, Peak Organic, Stone Mill Pale Ale and (for those concerned with drinking locally) Baltimore's Clipper City ales. The happy hour got started last December when Silver Spring-based author Christopher Mark O'Brien arrived for a talk about his book, "Fermenting Revolution: How to Drink Beer and Save the World." The talk was followed by a signing and organic beer tasting, which garnered such a positive response that Busboys has been running the weekly happy hour ever since -- and they don't sell these beers otherwise, so the only time you can get them is at the happy hour. Unfortunately for city mice, there are no plans for the event to migrate to the D.C. location. $4 beers (bottles). Wednesdays, 4-7 p.m. Busboys and Poets, 4251 S. Campbell Ave., Arlington. 703-379-9756. I'd recommend all of those beers except Stone Mill, which I'm neutral on. It's organic but is brewed by Anheuser-Busch and shipped in from California. Read more about sustainable beer options here. Nice to know that even after blogging for nearly two years, there are still hidden gems out there for The Green Miles to discover! After days of mysterious reports and devastating condemnations, Gov. Kaine's full letter to Virginia Air Pollution Control Board members has finally hit the net. As has been reported, it couldn't be more vaguely worded. Kaine writes that he wants to provide "clear direction on my expectations," yet never actually references Dominion's proposed 585-megawatt, $1.8 billion coal-fired power plant in Wise County. Kaine also never says what form of air pollution he's so concerned about. As for what prompted the letter, Kaine only makes a murky reference to "recent reports." 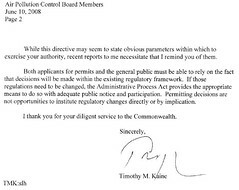 In fact, the letter really only makes one thing clear - board members should do as Kaine directs them. The governor uses some form of the word "direct" seven times in a ten-sentence letter. And we're supposed to believe this is "clean coal"? Right. As Cale Jaffe of the Southern Environmental Law Center said today, "If the issue is about enforcing the 'existing regulatory framework' as Gov. Kaine says, then this plant should not come close to getting permitted." An Air Pollution Control Board hearing on the plant is set for next week in Wise Co. Learn more at CCAN's website. Bristol Herald Courier: Kaine "Knee-Deep in the Muck"
UPDATE 4:40pm: Find the full text of the letter and more at RK. Gov. Kaine has already sacrificed huge amounts of credibility to go to bat for Dominion Virginia Power, cheerleading unrestrained dependence on coal even in the face of proposed massive rate increases. For some months, Virginia Gov. Tim Kaine has carefully stayed out of the controversy surrounding Dominion Power Co.’s proposed coal-fired plant in Wise County. No more. The governor is knee-deep in the muck – firing off an opaquely worded letter to the state Air Pollution Control Board that nudges the panel to give the plant its stamp of approval. It seems likely that Kaine wanted to influence the Air Pollution Control Board in private while preserving his public persona as an environmental crusader. He cannot have it both ways without being judged guilty of blatant hypocrisy. Check out more analysis of Kaine's letter from the former chair of the Virginia Outdoors Foundation. That was my reaction to Grist's green gift guide for Father's Day. Sure, it's got lots of cool stuff. The golf balls that dissolve in water are neat. But it is nevertheless mostly stuff, which Grist wisely urged us to avoid giving just last Christmas. Of course, I wasn't nuts about that list, either. Show your love for your dad by giving ... a carbon offset? Gee, just what I wanted! OK, so maybe I'm being too negative. What should you go for? Get dad something he can enjoy but won't add to his pile of stuff. Maybe a restaurant gift card (and mom will get a date out of it), a bottle of organic wine, or tickets to a ballgame or a show. So what did The Green Miles get his dad? An assortment of organic coffee, tea, and breakfast items from Green Mountain Coffee. And of course, a completely inappropriate e-card. The eco-friendliness of the e-card takes the sting out of the sarcasm. A recent hiking binge left The Green Miles in need of some new footwear. Sneakers are fine for most trails, but every once in a while you'll regret it when you jump off a ledge and a piece of gravel jabs the bottom of your foot through the soft sole. So I went shopping online for some new hiking boots. I only looked at Timberlands because of their commitment to sustainability. Timberland has pledged to make all its owned-and-operated facilities carbon neutral by 2010. 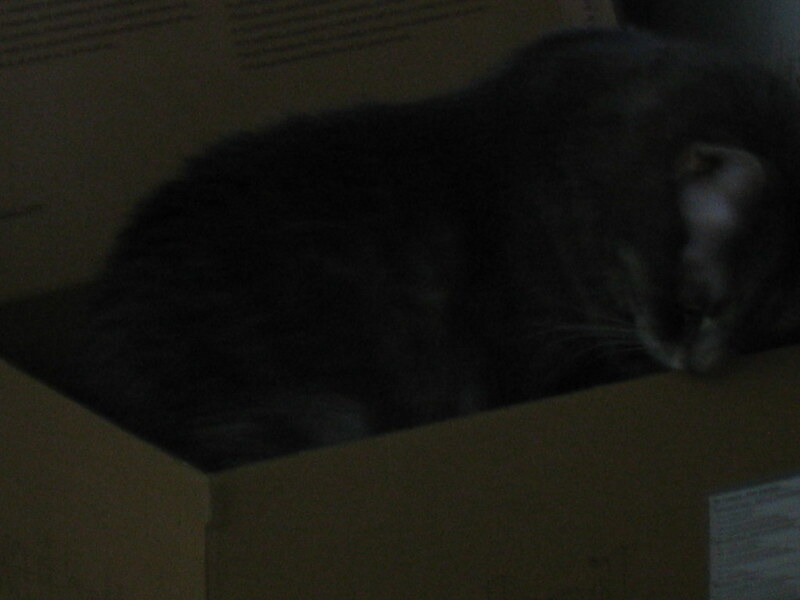 The shoes arrived today and literally announced their eco-friendliness from the moment I looked at the box. It had a big "RECYCLED" label on one end and had clearly been used to ship shoes a few times before making it to Arlington. Reusing is one of the few things that can truly be called carbon neutral, making the box free of cost for both Timberland and the planet. 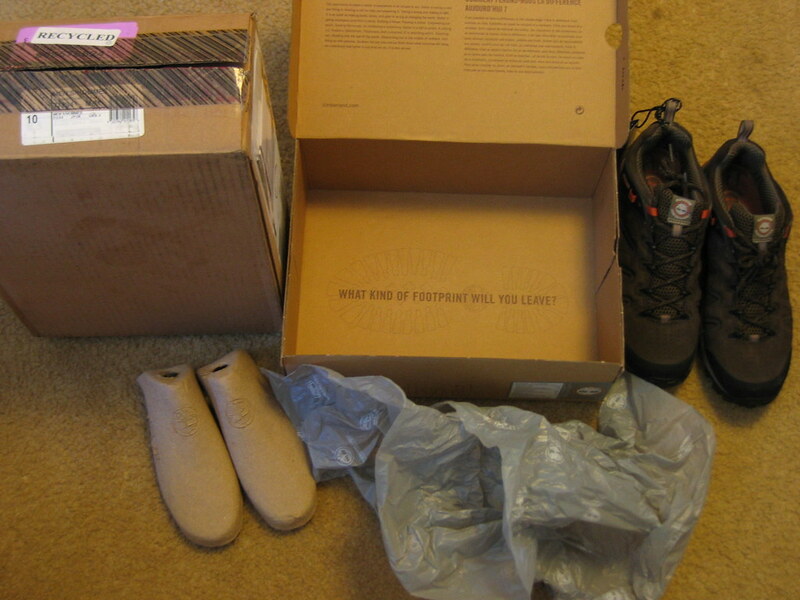 Inside the box was a shoe box made of 100% post-consumer recycled content and printed with soy-based ink. The shoe-stuffers looked to be made of recycled materials. In fact, the only part of the package that wasn't recyclable was the plastic shoe-wrap - which itself was made from recycled materials. The bottom of the shoe carried an "our footprint" sticker. It looked like a nutritional label, but instead of calories and dietary fiber it counted renewable energy and recycled content. 3pm: Arrive at top of canyon. 85, sunny. 4pm: Arrive at bottom of canyon. 80, thunderstorm. 5:30pm: Arrive back at top of canyon. 55, cloudy. 6:30pm: Exit park. 80, sunny. 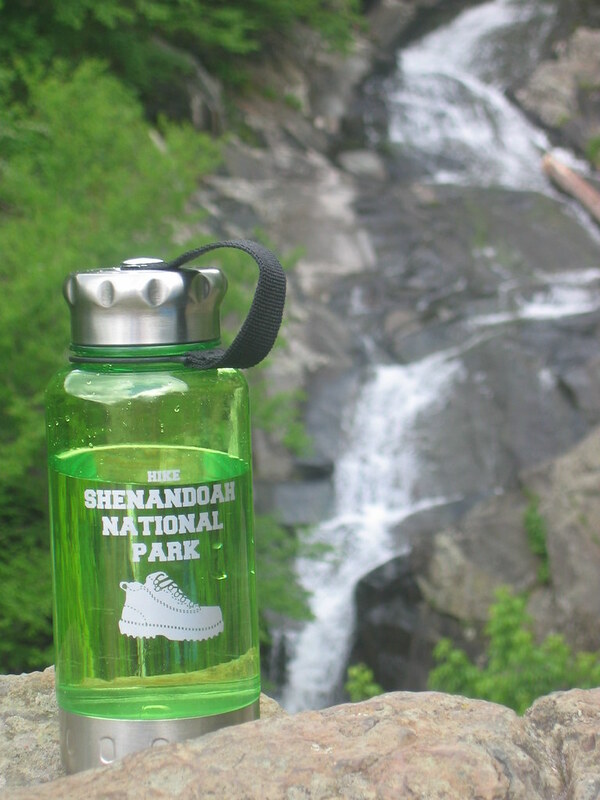 We stopped at the visitors center to grab some water, but instead of buying bottled, I grabbed a reusable water bottle. Didn't say if it was BPA-free, so I'm assuming it has it. I wouldn't use it every day, but for hikes and such, it'll do just fine. Kept the water surprisingly cool, too. H-B Woodlawn & The Green Miles on CNN! CNN just did a story on the eco-friendly prom of Arlington's H-B Woodlawn High School. It features Leslie Keller, H-B senior and Arlingtonians for a Clean Environment student board member. The Green Miles was also interviewed. Check it out! The Green Miles takes so many cell phone pictures at Harris Teeter, they must think I'm a Safeway spy or something. But there's good news to report. The Teet is now stocking Palmolive Eco dishwashing detergent, a phosphate-free alternative. As Grist's Ask Umbra reports, most dishwashing detergents use phosphates, which contribute to algae blooms and dead zones in the Chesapeake Bay even though natural enzymes work just as well. Virginia recently joined Maryland in banning phosphates from dishwasher detergent effective 2010. The legislation passed the Virginia General Assembly last year without a single opposing vote. The Teet also recently added an extensive selection of Seventh Generation products, so there are natural alternatives available for all sorts of kitchen and bathroom cleaners. The Green Miles is still wiped out from the big Climate Security Act throwdown last week, so just a quick post today. Lots of fun stuff in the pipeline though, promise. With any heat wave inevitably comes talk of strain on our power grid and even brownouts, which power companies then use to shill for more power plants and transmission lines. The typical household keeps the thermostat set at 72 degrees in the summertime, adds Sheree McKenna, coordinator for Edison's in-home audit program. For every degree you hike that temperature, it saves you about 3% on the cooling portion of your energy bill, she says. So if you raise the indoor temperature to 78 degrees in the summer, you save 18% on that portion of your bill. For a family spending $150 a month on air conditioning bills, that's a $27 monthly saving--enough to buy several new tank tops. They'll need them. If you're out of the house for most of the day, consider pushing the thermostat even higher, [Southern California Edison engineer Tony] Pierce suggests. Although the house won't feel quite as refreshing when you step in, for every hour that your 4-ton air conditioning unit doesn't run, a family that's used more than its "baseline" energy allotment will save $3.36. Over a 20-workday month, that cuts your bill by $67. Another common-sense tip - keep your house cool by keeping your curtains closed. In the long term, smart-thinking utilities are coming up with wicked cool new ideas to reduce power consumption at peak times, like the Ambient Orb. Watching the Climate Security Act cloture vote in the Senate right now on CSPAN2. An aye is to move forward with debating and amending the bill. A no is a vote to get behind the Roadblock Republican filibuster against climate action. I'll let you know what happens! UPDATE 9:33am: Cloture vote fails 48-36 (need 60 to break Republican filibuster). An additional six senators entered statements into the record that they couldn't make the vote but would've voted to move forward with the bill, bringing the total to 54 senators in support. 54-36 is nearly a reversal of the 38-60 vote in June 2005 on the McCain-Lieberman Climate Stewardship Act, a much weaker bill. Amazing how far the Senate has shifted in just three years! UPDATE 9:47am: Only four Democrats voted against moving forward -- Sherrod Brown (OH), Byron Dorgan (ND), Tim Johnson (SD) and Mary Landrieu (LA). After some questions about his position, Sen. Webb voted to end the filibuster. Thanks to all the Virginians who urged Sen. Webb to vote the right way! UPDATE 10:28am: Here's the full roll call vote. Webb to Vote with GOP Filibuster on Climate Action? I've heard from sources that Sen. Webb is "leaning against" supporting the Climate Security Act. Apparently Sen. Webb wants to protect coal interests like the Wise County coal-fired power plant, which a Virginia State Corporation Commission analysis shows would result in a net loss statewide of 1,474 jobs. A vote on continuing debate on the bill is expected to happen by Friday morning at the latest. If you haven't already, please take a few minutes to call Sen. Webb right now at (202) 224-4024 to ask him to strengthen and pass the Climate Security Act. Nats Go Green By ... Wearing Green Caps. No, Really. UPDATE 6/5: The game was rained out. According to the Post, "The Nationals had planned to wear green hats to promote environmental awareness and use a green theme around the park. The 'Go Green' theme will now be used Monday instead." Nationals players will be wearing green hats during the game. Discovery will have signs for the Planet Green channel at the stadium and ushers also will be wearing green hats. There will also be random giveaways during the game, including 5,000 free Metro cards. OK, so it's not exactly an overwhelming environmental agenda. And I doubt we'll hear any mention of the Climate Security Act. But it could be good if the right information is presented in a persuasive way. The Nationals also get some leeway since Nats Park is a LEED-certified green building. In any case, expect a full Genuine or Greenwashing report on the event in the days ahead. Following the interminable Senate discussion of the Climate Security Act? You can thank Senate Republicans for the unbelievable 30 hours of debate -- and that's before a single amendment can be offered. You see, Senate Minority Leader Mitch McConnell (up for re-election - hint, hint, Kentucky voters) doesn't want any Republicans on record on climate action. He'd much rather let people like Sen. Gordon Smith (R-OR) claim to support climate action without having to actually vote on any existing proposal. So McConnell is pushing for as much debate and delay as possible, living up to his reputation as the leader of the pack of the Roadblock Republicans. "We need to get some kind of agreement, a gentlemen's agreement, from the Republicans, or we'll have to approach it in a different manner," Reid said. Asked about the timing for the overall debate, Reid said he expected to give senators a chance to consider amendments through this week and into the next. "I would hope that we can finish the bill next week," he said. "That'd be really good. I'm not determined to get it off the floor this week." Senate Minority Leader Mitch McConnell (R-Ky.) said he expected Reid to allow an unlimited number of amendments on the bill, though he was not ready to say just how many the GOP planned to offer. "I don't have a number," he said. "We have some important amendments. I wouldn't call it an unlimited number." Oh, well that's reassuring. It's not an infinite number of amendments. It's safe to say it's somewhere between one and 196,843,012. If McConnell has his way, we should have a vote on the bill just as the Capitol is swallowed by rising sea levels. As Grist's Kate Sheppard reports, only three Republicans spoke in favor of climate action on the first day of debate. While there are other Republicans like Sen. Norm Coleman who back strong global warming legislation, the rest are doing their best to prove that if you want to be green, you have to vote blue. "Crunchy Con" Neighborhoods in DC Area? I recently discovered the Crunchy Con blog, written by a conservative environmentalist. I hadn't heard the term "crunchy con," but it's a lot catchier than Log Cabin Republicans, don't you think? I don't expect to agree with everything written by the author, Rod Dreher, but it's certainly a different take on politics. Just last week, posts criticized both Barack Obama and President Bush. One recent posts asks if there are any "crunchy con" neighborhoods in the DC area. The comments are definitely worth a read, some very thoughtful responses. The U.S. Senate opens debate today on the Climate Security Act. It's by far the strongest global warming legislation to make it this far in Congress. Check out Grist for the long version of the bill and its journey to the floor. The Climate Security Act aims to cut carbon dioxide emissions by setting up a cap-and-trade system, putting a price on global warming pollution. Revenues from the program would be used to promote the development of new low-emissions and efficient technologies, helping low- and middle-income families with energy costs, and preserving America’s natural resources. The legislation would also allocate resources to states and tribes to assist with local global warming efforts. Some greens are complaining the targets aren't tough enough. While deeper cuts would be ideal, the current ones are still light years ahead of anything even Democrats are proposing here in Virginia. The Climate Security Act would cut national emissions 19% from current levels by 2020 and close to 70% by 2050, while Gov. Kaine's Virginia Energy Plan would only aim for a 7% cut from current levels by 2025. While Sen. Warner is a co-sponsor of the bill, Sen. Webb hasn't yet indicated if he'll support it. Please take a few minutes to call Sen. Webb right now at (202) 224-4024 to ask him to strengthen and pass the Climate Security Act. "For the first time since the 1960s," [Department of Transportation Director Emeka] Moneme said, "More District workers are walking to work than driving." According to Moneme "Thirty nine percent of those who work in D.C. walk to work, compared to 35 percent who drive." Arlington's 2000 census numbers showed 65% of commuters drove to work (55% drove alone, 10% carpooled), while 23% took public transportation and 6% walked. Strangely, bike commuting wasn't listed as an option. Just 3% worked from home. I'm sure these numbers are changing by the day as gas prices continue to skyrocket. And overall, Metro ridership is up 25% since 2000, jumping from roughly 600,000 to 750,000 commuters per day.